We’ve now confirmed our second 2019 concert at St. Paul United Methodist Church in Christiansburg. It will be the first in our “Easter Parade” concert series. It will feature special guests “Clangin’ Around”, the New River Valley’s premier handbell and hand chime ensemble. You won’t want to miss this special event! Our second “Easter Parade” concert will be 6 pm, Saturday, April 20, 2019 at the Narrows Community Center. 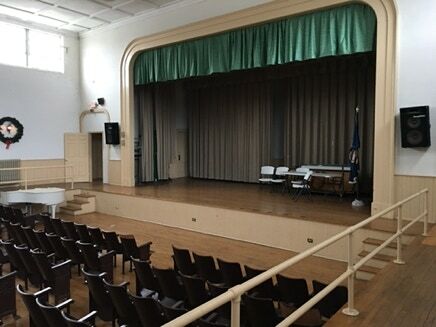 This historic venue has a walkway that completely encircles the audience on one level. Check out the pics below. We’re going to take advantage of this unique feature to stage a children’s parade while we perform “Easter Parade”. Picture a never-ending stream of balloon-festooned youngsters in Easter finery piloting wagons, scooters, and remote-controlled cars. 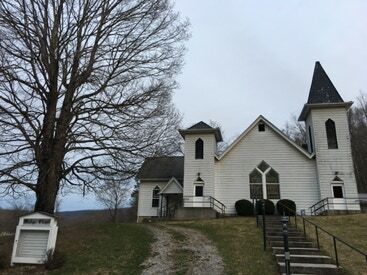 Our next concert will be 6 pm, Sunday, May 5, 2019 at the Wesley’s Chapel United Methodist Church at Bear Springs. 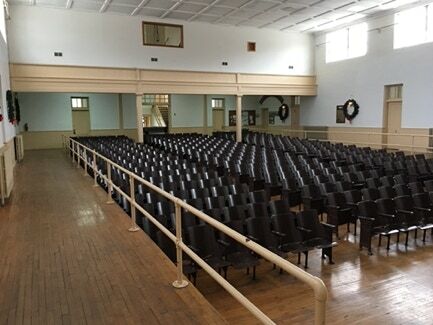 We’re really excited about using this historic venue, where noted circuit-riding minister Robert Sheffey preached. It’s right next to the Sheffey Memorial Campground. “No Place Like Home” is the theme of our summer concert series & we’ll preview some of that music at this concert. We’re also going to use this event to debut a brand new toe-tapping Southern gospel song called “I’m Going Home”, written by director Thomas DeBusk for GCCC member Donna Davis, in memory of her brother, David Stables.